A photograph taken during the Great Depression prompts Roger Hudson to re-evaluate Roosevelt’s New Deal. 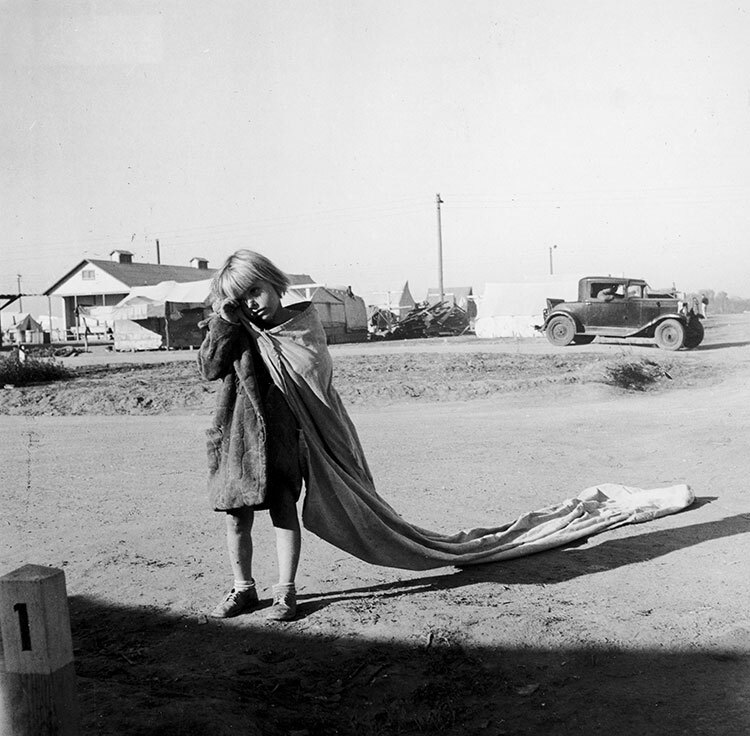 A young child stands by a Californian roadside in 1936 with her long sack, which she will hope to fill with the raw cotton she picks during the day. It is seven in the morning and the girl tries to keep the rising sun out of her eyes as Dorothea Lange clicks the shutter. Lange is one of the team of photographers working for the Farm Security Administration, who in the later 1930s are to take over a quarter of a million images of the ‘Okies’, as they are called, driven westwards out of the Dust Bowl states, primarily Oklahoma and Texas. They have been devastated by drought, farm foreclosures and repossessions brought on by the Great Depression. The aim of these pictures is not so much to inform as to move us, like Lange’s most famous photograph, now known as ‘Migrant Mother’, which has become one of the 20th century’s abiding images. The FSA was the part of President Roosevelt’s Depression counter-measures, his New Deal, which was aimed at easing rural poverty. From 1935 onwards it helped poor farmers to buy their land and in particular to aid the Okie migrants streaming into California in search of labouring jobs or becoming sharecroppers. It set up relief camps there and also communities, a form of collective, where poor farmers were to be re-educated in better methods. Apart from abject poverty, it tried to counter the hostility to, and exploitation of, these incomers by Californian farmers. This was the world depicted in John Steinbeck’s 1939 novel The Grapes of Wrath. Lange and her second husband, Paul Schuster Taylor, Professor of Economics at the University of California, Berkeley, spent five years documenting it all. The year before Roosevelt’s inauguration, 1932, had been the worst: 273,000 families were evicted or saw their farms foreclosed on by the banks, themselves in desperate straits. In October it was reckoned that 34 million Americans had no income whatsoever. GDP, which had been $104 billion in 1928 had collapsed to $41 billion. Working on a wing and a prayer, dispelling fear with his jaunty self-assurance and unrelenting cheerfulness, in 1933 Roosevelt brought in his New Deal. He forced those who had removed gold from their banks to put it back, lifted restrictions from big business, siphoned money from some public spending, channeling it into schemes such as the Civilian Conservation Corps, the Public Works Administration, the Tennessee Valley Authority, the FSA, as well as the Social Security Act – and building up huge debt along the way. The impact of the Depression on the Plains states had been made much worse by the dust storms there, particularly bad after the droughts of 1934, 1936 and 1939-40. With the arrival of tractors and combines, farmers had been tempted into deep ploughing to convert the grasslands to arable and this had removed the long-rooted grasses that had trapped soil and moisture. When the rains failed and the wind got up, millions of tons of fine soil were blown eastwards and it was only after huge damage had been done that preventive methods such as contour ploughing were introduced. Of the 3.5 million people who moved out of the Plains states between 1930 and 1940 up to a third were professionals and white-collar workers, whose salaries were hard hit by the Depression and Dust Bowl, since they derived from farm incomes. In retrospect it seems the New Deal never really amounted to more than a holding operation; deficit spending could only do so much. What really got the US economy going again was the war: to begin with, supplying the British and French and then arming the rapidly expanding US forces, both before and after Pearl Harbor. Suddenly there were millions of new factory jobs and the FSA wasn’t needed any more. Maybe this girl’s parents got jobs like these, while she got a decent education. However, there are photographs of black children as young as her still dragging sacks behind them in the cotton fields of the South long after she had grown up.